Up to 40,000 people have joined a so-called “Anti-Maidan” demo to mark the first anniversary of the bloody events during the Ukrainian coup on Kiev’s Independence Square, Russian police reported on Saturday. The 40,000-strong march against violence and revolutions, organized by the “Anti-Maidan” movement in the center of the Russian capital has been approved by local authorities, Moscow police said in a statement. “The number of participants was declared as not exceeding 10,000 people, but currently it is already far higher than stated before,” said Aleksey Mayorov, the head of the city’s police department, according to RIA-Novosti. 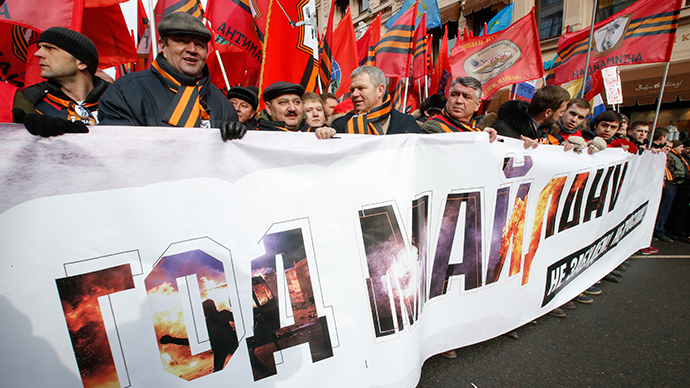 The march had a slogan: “A year since Maidan. We won’t forget, we won’t forgive!” The banners people were carrying read: “No to Maidan – no to war”, “Russia against Maidan”, “Maidan is deceit”. According to its organizers, the rally numbered 50,000 people. Aleksandr Zaldostanov, the leader of Russian motorcycle club “The Night Wolves”, said: “When the mobilization of Russia’s enemies takes place, I call to rally round Russia’s president,” TASS reported. The “Anti-Maidan” movement was founded this January in Moscow by a group of social activists to counter what they believe could pose a threat to Russia. Its main goal is to prevent so-called “color revolutions” in the country. Events led to then-President Viktor Yanukovich fleeing the country and the opposition forming a new government. In April, the new Kiev authorities started an anti-terrorist operation against breakaway regions in eastern Ukraine, who didn’t recognize the coup-imposed authorities in Ukraine. According to the latest UN estimates, the resulting civil war has claimed the lives of at least 5,600 people.